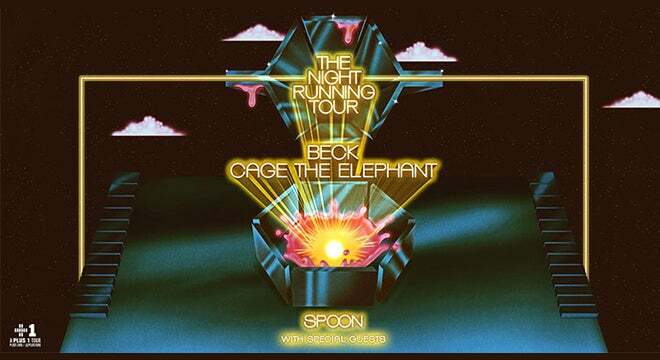 Tickets On Sale Starting Friday, February 15 at 10 a.m.
(DETROIT – February 11, 2019) – Today alternative, chart topping artists Beck and Cage The Elephant announced a North American co-headline tour across amphitheaters this summer – “The Night Running Tour”. Both artists are known for their amazing live performances and the energy they bring to their shows, making this an incredible co-headlining tour fans of both bands will not want to miss. They will be joined by special guest Spoon on all dates. Wild Belle will open as well when the tour hits DTE Energy Music Theatre on Saturday, August 3 at 6 p.m.
Tickets (starting at $29.50 on the United Shore lawn) go on sale Friday, February 15 at 10 a.m. and can be purchased at 313Presents.com, LiveNation.com, Little Caesars Arena XFINITY box office and Ticketmaster.com. To charge tickets by phone, call (800) 745-3000. Citi is the official presale credit card for the tour. As such, Citi cardmembers will have access to purchase presale tickets beginning Tuesday, February 12 at 12 p.m. local time until Thursday, February 14 at 10 p.m. local time through Citi’s Private Pass program. For complete presale details visit www.citiprivatepass.com. Having already WOWed listeners twice in 2019—first with “Tarantula” from Music Inspired by the Film ROMA, and more recently with “Super Cool” from The Lego Movie 2: The Second Part—Beck is excited to once again take it to the stage. While his 2017 album Colors (Capitol Records) has enjoyed some of the most positive reviews of Beck’s peerless career, as well as two Grammy® awards (Best Alternative Music Album and Best Engineered Album, Non-Classical), live performance has always been “Where It’s At” for modern music’s consummate chameleon. Cage The Elephant announced their return last week with the release of their fifth studio album, Social Cues, out April 19 via RCA Records. The album is the follow up to the Grammy®-winning Tell Me I'm Pretty. Tour mate Beck is featured on the album track “Night Running.” At radio, Cage The Elephant holds the record for the most #1 Alternative songs of any artist this decade. They’ve had 7 Billboard #1 singles with 11 singles landing in the Billboard Top 10 and digitally have a combined 1.5 billion streams worldwide. Cage The Elephant also shared their first single off Social Cues, “Ready To Let Go,” which leaped up the Alternative chart into the top 10 in just 11 days. Cage the Elephant debuts at 13* at AAA and is the #1 Greatest Gainer on both Billboard charts. Fans can pre-order Social Cues HERE.